Side planks are a great core-body exercise. There’s nothing like a stretch of beach to rev up your fitness routine. Trish Welch (right), Sea Island personal trainer and fitness instructor, leads a workout on the beach. Never-ending, sun-filled days are the perfect incentive to head outdoors and get some sand in your shoes. 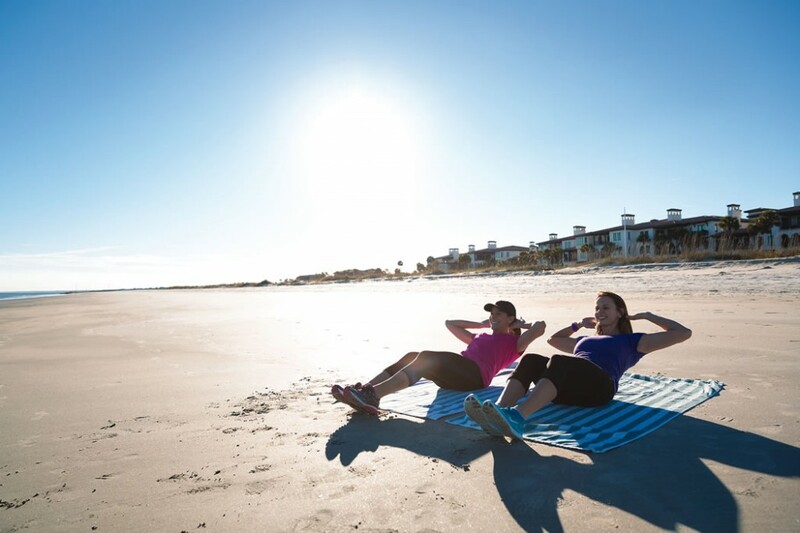 Trish Welch, Sea Island personal trainer and fitness instructor, says that working out with the challenge of shifting sands comes with a host of benefits that include improved strength, enhanced performance and better coordination. While the gorgeous seaside setting might inspire some to feel as though it’s possible to leap tall sand dunes in a single bound à la some famous superheroes, it’s important to build up gradually to a full-blown sand routine. Another one of Sea Island’s personal trainers and fitness instructors, Daniel “Ox” Hocutt, heeds a bit of caution to avoid overdoing a workout. Sand workouts can be safer on your joints than working out on a hard surface, but Hocutt suggests that it’s best to take it easy at first. Start by walking along the shore and progress from there, as pushing past your fitness level right away can result in shin splints and Achilles tendon problems. Both Hocutt and Welch advise trainees to wear shoes during a sand workout, despite the inclination to ditch footwear. Sand can hide debris that may not be easily visible while exercising. Whether beach-goers walk or simply stretch in the sand, they enjoy the perk of working out to one of nature’s unbeatable soundtracks: the soothing rhythm of waves washing ashore.